Concerns of Mercury Contamination in Primrose Lake Sparked by Ongoing Monitoring Sounds False Alarm but Reveals an Interesting Case. In early August of 2016, a member of the Cold Lake First Nation (C.L.F.N.) reported several lake whitefish (Coregonus clupeaformis) with white spots appearing as cysts on the outer surface of multiple digestive organs. The fish had been commercially netted by C.L.F.N. First Nations residents on Primrose Lake, which borders the central regions of eastern Alberta (AB) and western Saskatchewan (SK). Five of the visibly affected fish were submitted to CWHC –AB at the University Of Calgary Faculty Of Veterinary Medicine’s (UCVM) Diagnostic Services Unit (DSU) in Calgary, AB. 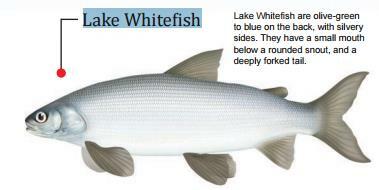 The lesions sparked the interest of many indigenous residents who net whitefish on this lake every year. Local inhabitants’ initial worries begged the question. Could mercury (Hg) contamination associated with bitumen extraction from the Primrose oil sands project be causing this form of lesion due to environmental toxicity? This concern lead to the submission of fish tissues to Prairie Diagnostic Services in Saskatoon, SK for heavy metal toxicological analyses. This theory produced negative results as no toxic levels of Hg were found. With the possibility of environmental toxicity eliminated, differential diagnoses turned to parasitic lesions termed cysts. The <0.5mm firm, round and smooth, pale yellow nodules found throughout the mesentery, stomach and intestine appeared characteristic of nematode larvae; a phylum of parasites commonly termed roundworms. 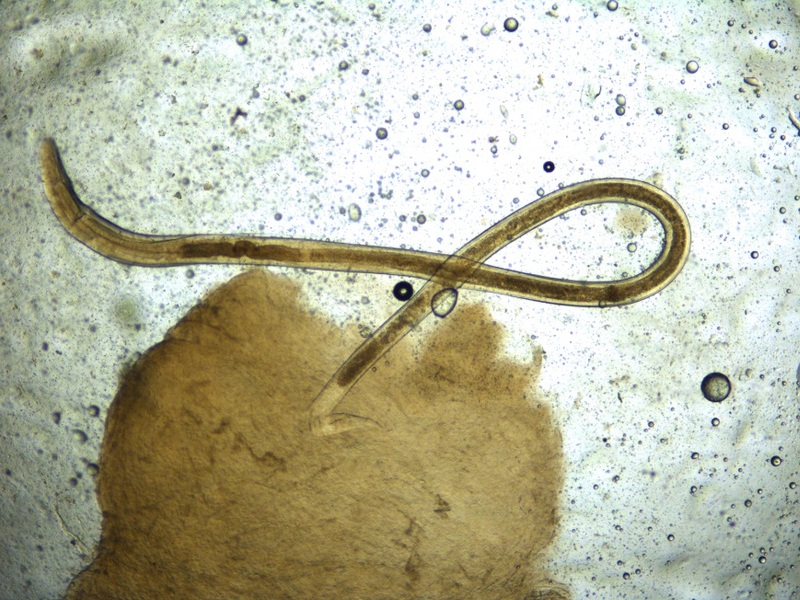 Appropriate samples were collected and submitted to a veterinary pathologist who confirmed the cysts housing nematode larvae to be Raphidascaris acus. This ascarid parasite is a common occurrence in Western Canadian freshwater fish. The lesions grossly appeared similar to a tapeworm, Diphyllobothrium dendriticum, which can infect lake whitefish and be consumed by humans who eat infected fish and subsequently infect the tertiary human host. Fortunately, samples submitted for molecular testing found no presence of this human dwelling tapeworm. This meant that the lesions in these fish were caused by a parasitic roundworm infection but posed no risk to humans consuming these affected whitefish, as this type of worm cannot cause infection in humans who indulge in their delectable nature. Raphidascaris acus nematode cysts present on the intestine of a lake whitefish from Primrose Lake, AB. Photo courtesy of UCVM Diagnostic Services Unit. Raphidascaris acus microscopic larva from a lake whitefish from Primrose Lake, AB. Photo curtesy of UCVM Diagnostic Services Unit.